NJ Weekend Historical Happenings: 3/31/18 - 4/1/18 ~ The History Girl! Celebrate Easter at Allaire Village! On Saturday, from 10:00 am - 4:00 pm, join us for an Allaire Village Easter Egg Hunt! There are over 10,000 eggs in the village! Hunts are divided into age groups: 0-1 (with an assisting adult), 2-4, 5-7, and 8-10. A hunt takes place every 15 minutes and hunts are continuous throughout the day from 11:30 am - 4:00 pm. The Easter Egg Hunt is $6 per person, children under age 1 admitted free! Pre-registration is highly recommended; all members of your party must have tickets, not only the children participating in the hunt. Tickets are available below or over the phone at 732-919-3500. Tickets will be reserved under your name and can be picked up upon your arrival. Registration and pre-registration check in takes place in the Visitor Center beginning at 10:00 am. Egg hunt times are assigned upon your arrival. * Bonnet Parade and Contest (bring your own home-made or purchase and decorate on-site) at 3:00 pm in front of the General Store. * Guess how many jellybeans are in the jar! If you guess them correctly, you get to take the jar home! Jar is located in the bakery. On Saturday, visit Historic Longstreet Farm in Holmdel from 1:00 - 3:00 pm, view a traditional hand quilting demonstration in the farmhouse. Clean-up Day on Saturday from 1:00 - 4:00 pm at Princeton Battlefield is sponsored by the Princeton Battlefield Society in collaboration with the Sierra Club. Also participating in the Civil War Trust’s Park Day, a nationwide clean-up day. Each participant will receive a free T-Shirt! This year we will have four teams – each with a team leader: Team – 1: Brush Removal – From “island” between Clarke House & Institute Woods; Team – 2: Historic Backroad Pathway – Removal of Small Brush & Bamboo; Team – 3: Invasive Porcelainberry Removal – from Dogwoods near Colonnade; and Team 4: Stick Picking-up – Around Shed for Young Kids. If you have tools (manual saws, clippers, and pruning shears) and gloves of your own, please bring them. Please RSVP with the name of the team you want to join. Go here to register/RSVP: www.theprincetonbattlefieldsociety.org. Heavy rain date is April 7. Princeton Battlefield is located at 500 Mercer Street, Princeton, NJ. For more information, e-mail roger@pbs1777.org or call 609-389-5657. 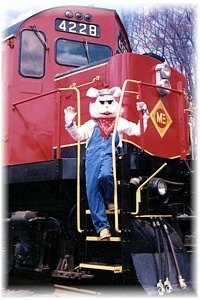 New Jersey's Original Easter Bunny Express celebrates its 26th continuous year of operation in 2018. Celebrate the return of spring and the Easter holidays with a ride on the Whippany Railway Museum's Easter Bunny Express. Our Special Easter Train Ride ensures a fun outing for the kids...and the entire family. So round up your family and friends and climb aboard for some great Easter fun and laughter! Ordering tickets is fast and easy! Trains depart at 1:00, 2:00, 3:00, and 4:00 pm each day, rain, snow, or shine. The Whippany Railroad is located at 1 Railroad Plaza, at the Intersection of Route 10 West & Whippany Road in Whippany, NJ. Train fare: Adults: $17.00, Children (under 12): $12.00, Infants (1 year and under): Free. The Museum building will be open from 12:00 noon - 4:00 pm each day of operation. Admission of $1.00 for children and $2.00 for adults (separate from train ride fare and payable at the door) supports the continued maintenance and restoration of the historic Museum building, grounds, and exhibit collection. On Saturday, Howell Living History Farm will open its henhouse to children and other visitors who want to meet newly hatched chicks, collect eggs from nest boxes, and learn how to candle and grade eggs. There is no charge to participate, but collectors will have the option of "paying" for their eggs by helping farmers grind feed. The Battle of Trenton will be recreated by using miniature figures, dice, and “Flint & Steel” rules developed by Richard Kane who will also be managing the game. Visitors can observe and some will be able to participate as the historic military commanders by issuing orders to their military units. As Colonel Rall can you save the Hessians from being captured by General Washington? It’s your chance to change history! The Battle of Trenton will be recreated at 1:00 pm at the Visitor Center Museum at Washington Crossing State Park in Titusville, New Jersey. The Visitor Center Museum will be open from 9:00 am - 4:00 pm featuring The Swan Historical Foundation’s Collection of 500+ Colonial and Revolutionary War artifacts. The Visitor Center Museum can be reached from I-95 by taking the Trenton/Lambertville Exit (this is the first exit in N.J. heading north and the last exit heading south). Head north on Route 29 for 2 ½ miles and turn right at the first traffic light. Park Entrance will be on your left in a ½ mile. Enter the park and follow the signs to the Visitor Center Museum. For more information call 609-737-0623. Get into the spirit of things on a guided tour of the historic (some say haunted) Physick Estate, which includes a discussion of Victorian spiritualism on Saturday at 7:30 pm. This is a limited tour. Admission is $12 for adults, $8 for children (ages 3-12). Tickets can be purchased at the Emlen Physick Estate, 1048 Washington Street, Cape May, NJ. Sponsored by the Mid-Atlantic Center for the Arts & Humanities (MAC). For more information and to reserve tickets, call 609-884-5404 or 800-275-4278 or visit www.capemaymac.org. Combine the Ghosts of Cape May trolley tour with a visit to the 1879 Emlen Physick Estate, where you will visit a home séance room of the 1890s and learn of the Victorians' fascination with spiritualism on Saturday at 7:00 pm. Admission is $22 for adults, $14 for children (ages 3-12). Tickets can be purchased at the Emlen Physick Estate, 1048 Washington Street, Cape May, NJ. Sponsored by the Mid-Atlantic Center for the Arts & Humanities (MAC). For more information and to reserve tickets, call 609-884-5404 or 800-275-4278 or visit www.capemaymac.org. Take this spine-tingling, 30-minute evening trolley ride through the streets of Cape May with a guide who relates the paranormal findings of medium Craig McManus on Saturday at 8:30 pm. Admission is $12 for adults, $8 for children (ages 3-12). Tours leave from the Washington Street Mall Information Booth at Ocean Street. Sponsored by the Mid-Atlantic Center for the Arts & Humanities (MAC). For more information, call 609-884-5404 or 800-275-4278 or visit www.capemaymac.org. Fire Control Tower No. 23 on Sunset Boulevard is New Jersey's last freestanding World War II tower, part of the immense Harbor Defense of the Delaware system known as Fort Miles. After an award-winning restoration in 2009, visitors can climb to the 6th floor spotting gallery while learning about the homeland defense efforts during World War II. The ground floor of the tower, the All Veterans Memorial, and boardwalk interpretive panels are fully accessible. Reopening for the season on Saturday from 11:00 am - 3 pm. Admission is $6 for adults, $3 for children (ages 3-12) (One child free with paying adult). The World War II Lookout Tower is located on Sunset Boulevard in Lower Township, near Cape May Point. Sponsored by the Mid-Atlantic Center for the Arts & Humanities (MAC). For more information, call 609-884-5404 or 800-275-4278 or visit www.capemaymac.org. On Sunday at 6:00 am, Allaire Village, Inc. will be co-sponsoring an Easter Sunrise Service at the Allaire Chapel. The park gates will open at 5:30 am. The service will be held in the Historic Village Chapel. Admission is free (donations gladly accepted). This service is presented free of charge by Allaire Village Incorporated and the Churches of the Farmingdale-Howell Council of Churches. All are welcome to attend the service. This wonderful non-denominational service is the perfect event for the whole family. Watch the sunrise over the forest as you celebrate the season. *The New Jersey State Museum and Planetarium will be open on Saturday ONLY from 9:00 am - 4:45 pm. The museum is located at 205 State Street, Trenton, NJ. Suggested donation $5. For more information, call 609-292-6300 or visit www.state.nj.us/state/museum. *The Stickley Museum at Craftsman Farms in Parsippany-Troy Hills, NJ is open for tours on Saturday ONLY from 12:00 noon - 4:00 pm. Explore the Log House at Craftsman Farms, Gustav Stickley’s rustic country estate and a National Historic Landmark. Largely restored to its 1910 - 1917 appearance. The Log House at Craftsman Farms is the only home Stickley designed and built for his own use. Admission: $10 Adults, $7 Seniors and Students, $4 Children (up to age 12), and free for members, and children age two and under. Craftsman Farms is located at 2352 Route 10 West, Morris Plains, NJ. For more information, call 973-540-1165 or visit www.stickleymuseum.org. *Battleship New Jersey in Camden, New Jersey is open for public tours on Saturday and Sunday from 9:30 am - 3:00 pm. Explore America's most decorated Battleship. Exploring “BB62” is experiencing history in a whole new way. Not only do you see exhibits of artifacts from the ship’s past, but you are put into the exhibit as you go through the tour route. Sit in the chair from which Admiral Halsey commanded the fleet. Stretch out on the bunks where the sailors slept. Climb into the 16” gun turret and learn how the projectiles were loaded. Battleship New Jersey is located at 62 Battleship Place, Camden, NJ. For more information, call 866-877-6262 or 856-966-1652 or visit www.battleshipnewjersey.org. *Ringwood Manor in Ringwood State Park is open for public tours on Saturday and Sunday, starting every hour from 10:00 am - 3:00 pm, with the exception of the 12:00 noon hour. Adults $3; Children ages 6-12 $1; Children ages 5 and under are free. Ringwood Manor is located at 1304 Sloatsburg Road, Ringwood, NJ. For more information, call 973-962-7031 ext. 0 or visit www.ringwoodmanor.org. *The Cape May Lighthouse will be open Saturday and Sunday. 215 Lighthouse Avenue, Cape May, NJ. Open 11:00 am - 3:00 pm. Admission: $8 for adults; $3 for children (ages 3-12). For more information, visit www.capemaymac.org. *The Absecon Lighthouse in Atlantic City will be open from 11:00 am - 4:00 pm on Saturday and Sunday. The Absecon Lighthouse is located at 31 South Rhode Island Avenue, Atlantic City, NJ. For more information, call 609-449-1360 or visit www.abseconlighthouse.org. The Passaic County Historical Society announces the opening of its newest temporary exhibit, Clifton Association of Artists' Annual Members' Show. On exhibit from Wednesday March 28th until Sunday May 6th, this exhibition’s theme is travel, with works by members of the Clifton Association of Artists. 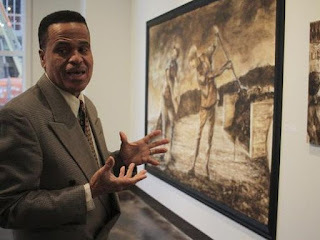 The association, which is comprised of members for Clifton and the surrounding area, includes artists of all skill levels who work in venues like watercolor, oil, and pastel painting, photography, sculpture and ceramics. 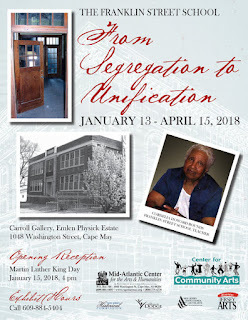 The Clifton Association of Artists is sponsored by the Clifton Recreation Department.